Just because you don’t have a website yet doesn’t mean you shouldn’t be capturing potential users! A ‘coming soon’ page is a great way to get followers on Facbook, Twitter, or anywhere else where they can keep informed on your progress. Setting up and modifying Jackhammer is easy as pie! All sizes and colors are managed through an easy-to-read CSS file. If you want to use the countdown time, you just need to add your estimated delivery date to the .js file. Unlike JPG’s and PNG’s, SVG graphics are 100% scalable. It doesn’t matter if you look at them on your iPhone or if you zoom in 10x on a high-res screen, they will always have clean, precise edges without pixelation. Jackhammer works flawlessly with all major browsers, even iOS and Internet Explorer. 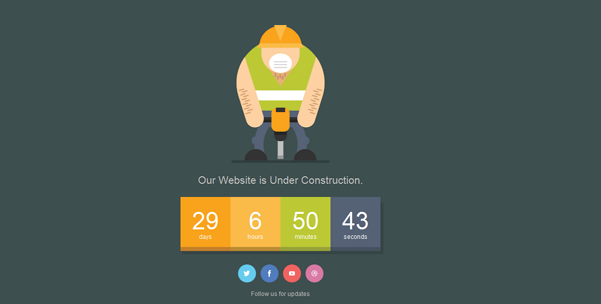 Item Reviewed: Jackhammer Awesome Animated SVG Under Construction Page 9 out of 10 based on 10 ratings. 9 user reviews.